We know that not all forms need to be open indefinitely. So, at the end of last year, we released our Form Scheduling feature. It was something that some of our users had requested because they wanted to limit form submissions without manually removing the form. How does form scheduling work? The feature simply allows users to put time limits on their forms to manage the number of responses that come in. This prevents people from trying to sign-up for something which is closed for submissions or has a deadline that has passed. When the form has closed, anyone trying to submit an entry will be shown a message like: “This form is currently closed for submissions” This message can be customized if you wish. Open - It means the form will be always open and accept submissions indefinitely. Closed - Set this to manually close the form to submissions at any time. Schedule - Select this to schedule the form's open and close date and time. Limit entries - Close the form after a specified number of entries have already been submitted. This is based on the total count of entries in the form. Schedule and Limit Entries - As well as scheduling, you can also limit the number of submissions in the form. When a close date and a limit are set at the same time, the form will be closed based on which is reached first. It's really simply to set your form to open and close on a specific date and time. To set a specific time, you'll need to use the HH:MM format. For example, to open the form at 8.30am, you will need to type in 08:30. This feature will match the timezone that's set in your WordPress settings. If you are only opening submissions and sign-ups to your website for a limited time, this ensures there's a natural cut-off point. That's less data for you to manage, which saves you time. Additionally, without a closed submissions message, users may be unaware that a deadline has passed. They could submit anyway, which can be frustrating if they don't get a response or are told their submission will not be counted. A closed form means that users will know straight away that they're too late. This can reduce upset and confusion. Job application forms that have a deadline. Signing up students for a class that has already started. 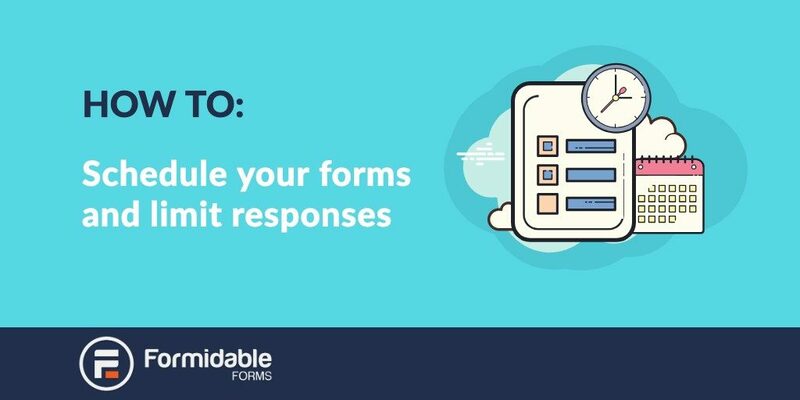 If you're not already using Formidable Forms and would like a simple way to build forms, take a look at our drag and drop form builder.